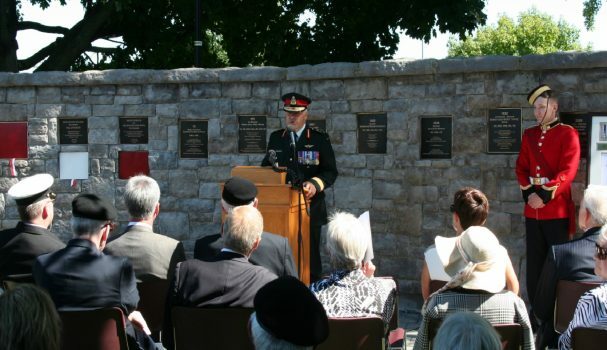 Above: RMC Commandant 18777 BGen Sebastien Bouchard addresses the audience at the 2018 Wall of Honour Ceremony last month. Working on a product like e-Veritas means that “relevance” is a concept that gets tossed around a lot. It’s also a concept that I’ve seen applied to Canadian Military Colleges in general over the last few years (especially in light of various studies). In short, the question seems to be, “What can you get from an RMC education that you can’t get elsewhere?” What justifies the cost? One response I heard during the 2018 Wall of Honour Ceremony for 2375 LCol Norman Bruce “Ike” Buchanan is that there is something about going through military college in this country that sets ex-Cadets apart, especially after their time in the CF is done. There is a palpable legacy of service that endures, more often than not, no matter where the individual ex-Cadet ends up. Having come back to the College myself, and living now in Kingston, I see signs of this even with current Cadets. When I encounter Cadets as I’m out and about in town, whether they’re in uniform or not (and if they’re not you can generally still tell who they are), there’s just something different about them when compared with students at Queen’s or St. Lawrence College for example. And that’s not meant in the least as a criticism of those institutions. There’s just something different about Cadets. I did three semesters of civilian university before coming to RMC and so I can speak, I think, to that difference in some detail. I may be generalizing some, but within the civilian university context it is by and large about you, the individual. If you screw up, you hurt yourself. At RMC you’re part of something greater than yourself. If you screw up, your roommate, or your section, or your flight, will suffer, too. The mindset such an experience breeds has never been more relevant. And I for one look forward to seeing that tradition of service continue both inside the Forces and in the civilian world.